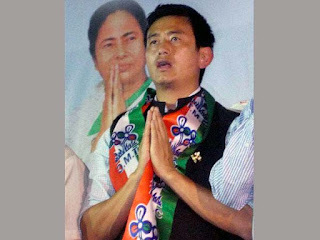 Mamata Banerjee is likely to announce the new president of the Darjeeling Trinamul district committee in Calcutta tomorrow and ex-footballer Bhaichung Bhutia and Pratul Chakraborty are being considered for the post, sources in the organisation said. The chief minister, said the sources, wanted the replacement of Ranjan Sarkar, the current president of the party in Darjeeling, as Trinamul had failed in three consecutive elections in the district in one year. The defeat of Trinamul in the Siliguri municipal and mahakuma parishad polls and the Assembly elections has been attributed to factionalism in the party. "Tomorrow, a meeting has been convened by the party at Netaji Indoor Stadium in Calcutta where leaders from different districts will be present. Our party chief Mamata Banerjee and other frontline leaders will be at the meeting. We can almost confirm that the name of the new Darjeeling district president will be announced tomorrow. The names of Bhaichung Bhutia and Pratul Chakraborty are making the rounds," a Siliguri Trinamul leader, who didn't want to be named, said over the phone from Calcutta today. Another senior leader said Bhaichung might be made the working president of Trinamul in the district. "Bhaichung has never made it to district and state committees. There is a chance that Pratul Chakraborty will be the new president, while Bhaichung will be made the working president of Darjeeling district. It can be an effective arrangement as Bhaichung can try to bring all lobbies in the party together and end factionalism, while Pratulda, who has good acceptability, can monitor from the top," said the leader. There are also speculations that Bhaichung will be appointed as the chairman of the Siliguri Jalpaiguri Development Authority. Bhaichung had lost to the CPM's Asok Bhattacharya in Siliguri in the Assembly polls. Chakraborty had held the post of the district president before Gautam Deb. Following the debacle Trinamul faced in the municipal and mahakuma parishad polls last year, minister Gautam Deb was removed as the Trinamul district chief in November. He was replaced with Sarkar, who was the district Trinamul Youth president then. But even after Sarkar, who is also a municipal councillor in Siliguri, became the president, Trinamul couldn't win any of the six Assembly seats in the district.